The Kalahari Desert is not really a desert, but rather a large arid to semi-arid sandy area in southern Africa, covering much of Botswana and parts of Namibia and South Africa. Though it is semi-desert, it has huge tracts of excellent grazing after good rains and is rich in wildlife. The homeland of the Bushmen for perhaps thirty thousand years, the desert was the setting for the movie The Gods Must Be Crazy, which featured a Bushman family. A strange, yet essential feature of this region are the pans, which are shallow hollows consisting of hard, gray clay. While appearing drab and flat, these pans provide essential salt for the animals of the Kalahari. They vary in size from a few hundred meters to a few square kilometers. There are two other distinct ecosystems found in the central Kalahari region: rich savanna and grasslands. The core area of the desert covers an area of 100,000 square miles (260,000 square kilometers). But the surrounding Kalahari Basin covers over 2.5 million square kilometers, extending farther into Botswana, Namibia, and South Africa and encroaching into parts of Angola, Zambia, and Zimbabwe. The only permanent river, the Okavango, flows into a delta in northwest Botswana, forming marshes that draw abundant wildlife. Ancient dry riverbeds—called omuramba—traverse the central northern reaches of the Kalahari and provide standing pools of water during the rainy season. Previously havens for wild animals from elephants to giraffes, and for predators such as lions and cheetahs, the riverbeds are now mostly grazing spots, though leopards or cheetahs can still be found. The Kalahari has existed as an inland desert since the Cretaceous period (65-135 million years ago). It has experienced both periods of greater humidity and more aridity, documented in fossil dune fields. It was during a period of greater rainfall that the Makgadikgadi Depression in northern Botswana was formed. The former lake at one point covered 23,000 square miles (60,000 square kilometers), about the same size as Lake Victoria today. The dry riverbeds that now only hold water when it rains are also from such periods. 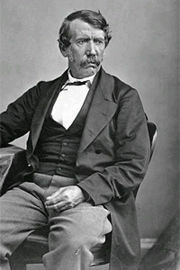 The first European to cross the Kalahari was David Livingstone, accompanied by William C. Oswell, in 1849. In 1878-1879 a party of Boers, with about three hundred wagons, trekked from the Transvaal across the Kalahari to Ngami and on into Angola. Survivors stated that some 250 people and nine thousand cattle died on the journey. The first Europeans who entered the Kalahari after Livingstone came as travelers, missionaries, ivory hunters, and traders. The only European settlement was in the Ghanzi District, where a number of families were allowed ranching blocks in the 1890s. Until the 1960s they led a life of isolation and poverty, but since then they have been able to gain ownership of the land and improve their living conditions. Most other whites in the Kalahari are government employees or are engaged in private enterprise. 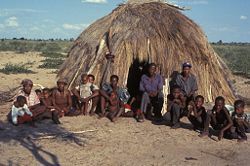 Bushmen community at Gope, Central Kalahari Game Reserve, Botswana. Image © courtesy of Survival International. The Kalahari is the ancestral land of the Bushmen or San peoples. There are many distinct tribes, and they have no collective name for themselves. The names San and Basarwa are sometimes used, but the people themselves dislike these names (San is a Khoikhoi word meaning outsider, and Basarwa a Herero word meaning person who has nothing) and prefer the name "Bushman." Their language, Khoisan, is a language of clicks. The name Bushmen was given to them by early settlers who may have named them for the fact they live in the bush or it might have been given because of their use of aromatic spices collected from various bushes. They are thought to have been the first human inhabitants of Southern Africa; there is evidence that they have been living there continuously as nomadic hunter-gatherers for over twenty thousand years. The Bushmen were first brought to the Western world's attention in the 1950s when South African author Laurens van der Post published his famous book The Lost World of the Kalahari, which was also turned into a BBC TV series. This and other later works about the Kalahari prompted the British colonial authorities to create the Central Kalahari Game Reserve in 1961 to preserve the Bushmen and the wildlife. After independence, Botswana provided food, water, and medical care to them, but eventually they began raising goats and planting crops. Wildlife officials were concerned about the impact on the environment and the government balked at providing services to remote villages. About three thousand of the estimated hundred thousand remaining Bushmen moved into settlements. Some two hundred, however, sued the government of Botswana for the right to return to their homeland, and the High Court ruled in December 2006 that the Bushmen are entitled to live and hunt on their ancestral lands. However, the government placed limits on what they could take with them. They cannot bring domesticated animals with them or build permanent structures. Hunters have to apply for permits, and only those named in the original lawsuit may return. Today the Bushmen are offering a taste of their life to tourists to bring in money. Bushman activities that can be experienced by visitors include identifying natural salt/mineral licks, medicinal plants, trees, bushes, spoor, birds, and other animals; gathering and preparing foods; learning their dances and playing the foot bow. They can go on a guided simulation hunt and watch demonstrations of traditional skills, such as making "jewelry" from ostrich eggshells, glass beads, and seeds; tanning skins and curing hides; and making rope and glue. Derived from the Tswana word Keir, meaning the great thirst, or the tribal word Khalagari or Kalagare (meaning "a waterless place"), the Kalahari has vast areas covered by red-brown sands without any permanent surface water. Drainage is by dry valleys, seasonally inundated pans, and the large salt pans of the Makgadikgadi Pan in Botswana and Etosha Pan in Namibia. The Kalahari is not considered a true desert. Traditionally, an area was classified as desert if it received less than 10 inches (250 millimeters) of rain annually. A more accurate definition of a desert is a region in which the potential evaporation rate is twice as great as the precipitation. Both of these criteria are applicable to the southwestern half of the Kalahari, which receives less than 175 millimeters of rain annually. The northeastern portion, however, receives much more rainfall and, climatically, cannot qualify as a desert; and yet, it is totally lacking in surface water. Rain drains instantly through the deep sands of the area, which creates a situation of edaphic drought (soil completely devoid of moisture). Summer temperatures in the Kalahari range from 20 to 40 °C. 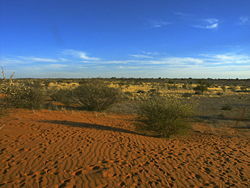 In winter, the Kalahari has a dry, cold climate with frosts at night. The low winter temperature can average below 0 °C. Local herders who overgraze their sheep, goats, and karakul (a kind of sheep) contribute to desertification by removing the vegetation. In the Okavango Delta region, Botswana and Namibia have at times made plans to tap its waters during prolonged periods of drought. Though those plans were shelved, a future water crisis as the population grows might renew the calls to use the waters from the Okavango River and the delta in which it ends. Angola, where the river originates; Botswana; and Namibia have signed a regional agreement on water usage, overseen by the Permanent Okavango River Basin Water Commission. There are large coal, copper, nickel, and uranium deposits in the region. One of the largest diamond mines in the world is located at Orapa in the Makgadikgadi, in the northeastern Kalahari. Pomfret, on the edge of the desert, has asbestos in the subsoil and a shuttered asbestos mine. The Kalahari Desert contains many unique plants, including medicinal plants whose uses have been learned from the Bushmen. The great value of Devil’s claw, or Harpagophytum, as a natural medicine was learned by the Germans (from the Bushmen). This resulted in a multimillion-dollar international industry, which incidentally led to the local extinction of the plant in many areas. Extremely deep root system: for example, the Camel Thorn Tree, Acacia erioloba, has roots up to 40 meters long. Large underground tubers, with a small exposed part: Many little-known Kalahri plants follow this route. Extremely rapid growth cycle: the Devils thorn, Tribulus terestris, that completes its complete life cycle from germination to flowering and seed-forming within as little as two weeks, is a typical example. By forming large and treelike to shrublike forms of the same plant, depending on local conditions: The Grey Camel thorn, Acacia haematoxylon, is a prime example of this. The Kalahari has a number of game reserves, includng the Central Kalahari Game Reserve (CKGR), the world's second largest protected area; Khutse Game Reserve; and the Kgalagadi Transfrontier Park. The area's remoteness, unforgiving climate, and harsh terrain have kept it pristine. Animals that live in the region include brown hyenas, lions, meerkats, several species of antelope, including the oryx or gemsbok, warthogs, cheetahs, wild dogs, leopards, and many species of birds and reptiles. Vegetation in the Kalahari consists mainly of grasses and acacias but there are over four hundred identified plant species present (including the wild watermelon or tsamma melon). Four fossil rivers twist and turn through the arid reserve. Among them is Deception Valley, a dusty old watercourse that wound its way through the northern Kalahari sixteen thousand years ago and is today a well-known game watching area. For seven years, Mark and Delia Owens lived in tents in Deception Valley, doing landmark research on black-maned Kalahari lions and the elusive brown hyena. After surviving violent storms, wildfires, and 120-degree heat during their research, they chronicled their findings in their book Cry of the Kalahari. A variety of grasses, acacia, thorn trees, and other tough, drought-resistant plants cover most of CKGR. Among the shallow valleys, tsamma melons and gemsbok cucumbers are found, which provide the main source of water for the animals and Bushmen during the dry season. The CKGR was originally set aside in 1961 as a homeland for the Bushmen. The Khutse Game Reserve, the southern extension of the Kalahari Game Reserve, was established to conserve the pans of the Central Kalahari. The reserve’s grass and shrub lands attract herds of antelope, and these in turn attract the attention of endangered predators such as the cheetah and wild dog. After a good rainfall as many as 150 species of birds may be spotted around the pans. Kgalagadi means "place of thirst." The terrain consists of red sand dunes, sparse vegetation, occasional trees, and the dry riverbeds of the Nossob and Auob Rivers. The rivers are said to flow only about once per century. They may flow briefly after large thunderstorms, a cause for celebration among the wildlife who flock to the river beds to drink. However, water flows underground and provides life for grass and camelthorn trees growing in the river beds. ↑ 1.0 1.1 George Bertrand Silberbauer, “Kalahari.” Encyclopædia Britannica Online. Retrieved April 13, 2007. ↑ Mary Sadler-Altena, Overview and description of the Kalahari-basin. Southerncape.co.za. Retrieved June 7, 2007. ↑ Daniel, Zoe. August 11, 2005. “South Africa – Pomfret.” The Australian Broadcasting Corporation. Retrieved April 14, 2007. Kalahari Safari Go2Africa.com. Retrieved May 30, 2014. "Court victory proves hollow for Bushmen." Washington Times (January 18, 2007). Bushmen of the Kalahari – Owens Foundation for Wildlife Conservation. Central Kalahari Game Reserve Pictures, Botswana – IanandWendy.com. 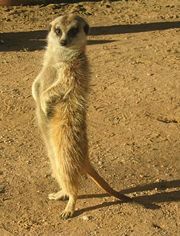 Welcome to the Green Kalahari Upington.com – Tourist Information about the Kalahari.